I am new to Libcom. I am looking for contacts to libertarian people in Tunis as I will e travelling there soon. Any ideas? Tried to contact the Harakat 3syan (Disobedience movement) but failed so far. You could try to get in touch with Tunisian rappers, Armada Bizerta.. though I notice their facebook hasn't been updated in a while.. I have already posted this in another thread, its an initiative by supporters of IFA. As for the situation in Syria and Libya, Islamist mercenary groups financed by some Arab Emirate and / or Iran, confiscated the people's struggle against oppression and dictatorship for their own account. The Syrian people, in particular, find themselves in the fight against the barbarism of Bashar al-Assad and against fighters for the Islamic Caliphate. For this, the Tunisian libertarian group "The Libertarian Commons", the Anarchist Federation and the International of Anarchist Federations (IAF-IFA) invite you to the Mediterranean anarchist meetings to be held in Tunisia from 27 to 29 March 2015. This invitation is open to all and all our comrades, including those who do not belong to this region. Le peuple veut la chute du système. 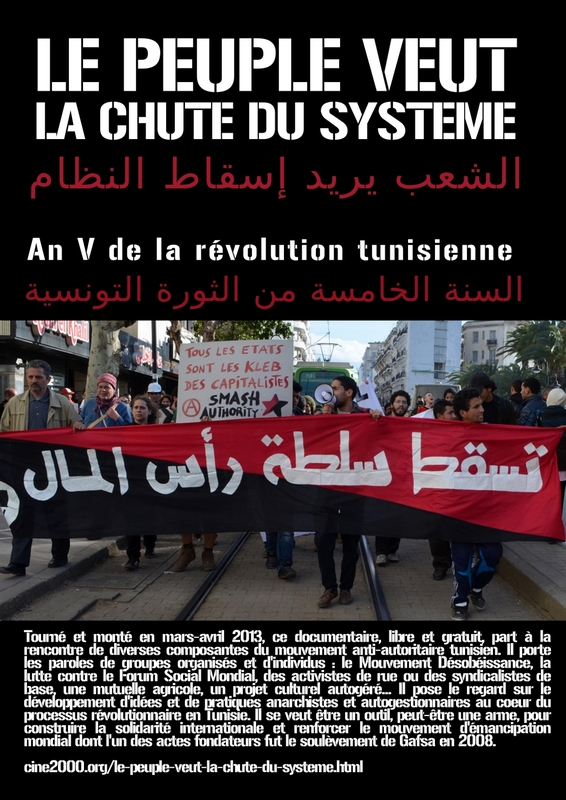 An V de la révolution tunisienne. - a one hour documentary focusing on the role of libertarians during those years, in the Mouvement Désobéissanc. I have a contact who is a member of the group Le Commun Libertaire in Tunisia, but it was maybe a year since I heard from my friend. I should get into contact to check out what has been going on since then.